ATLANTA, Jan. 13, 2013 - The Georgia Guard's Spc. Ogletree and Sgt. 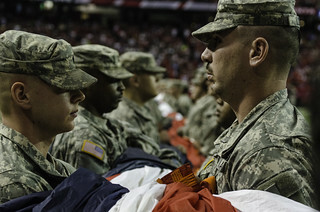 Lore hold the far end of a 100-yard-long American flag as part of the opening to the Atlanta Falcons NFL division playoff against the Seattle Seahawks.